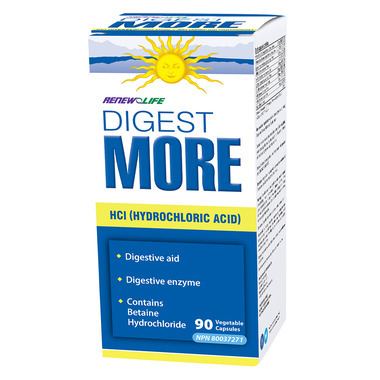 DigestMORE HCl is a comprehensive digestive enzyme formula that contains Betaine Hydrochloride (HCl) and butyric acid. DigestMORE HCl is helpful for those who suffer from heartburn caused by low stomach acid. It can also be used by those who are concerned about accidental ingestion of bacteria or parasites when traveling or eating out at restaurants. Directions for Use: Take one capsule with each meal. *DigestMORE HCl contains a strong odour. Peppermint has been added to mask the odour of this product. 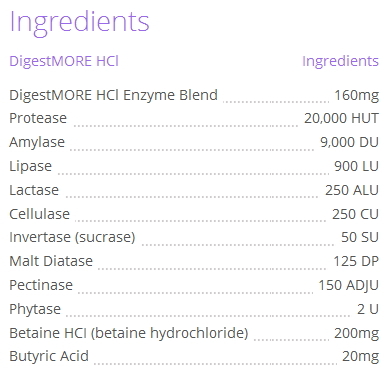 DigestMORE HCl contains no dairy, wheat, gluten, soy, corn, yeast, additives or preservatives. Renew Life does not use genetically modified ingredients. All ingredients are NON-GMO. Warnings: Discontinue use if abdominal pain, nausea or vomiting occurs unless directed by a physician. Do not use after recent surgery. Do not use if gastritis, gastric or duodenal ulcer are present. Do not use if pregnant or breastfeeding. Do not exceed recommended dose. Keep out of reach of children. No refrigeration required. Store in a cool, dry place. This has helped my heartburn issues.